Has processor performance finally maxed out? The chip-maker’s Epyc platform has the speeds and feeds to beat Intel. Will it make a difference? Editor's note: This story, originally published on May 16, 2017, was updated because AMD changed the name of the processor from Naples to Epyc. Changes appear throughout. There aren't many second acts in technology, let alone a third. But that isn't stopping AMD. In the early part of the century, AMD shook up the computing world when it introduced three major changes to the x86 CPU: multi-core CPUs, 64-bit extensions, and moving the memory controller onto the CPU instead of a separate front-side bus. As a result, the company suddenly became very competitive with Intel and began taking market share. Nowhere was that more obvious than in servers, where the company introduced its first server product, called Opteron. Quickly AMD soared to 20 percent market share on the server. Then it stumbled with the "Barcelona" processor in 2007, where it tried to do too much at once, and a reinvigorated Intel got its act together. Today, Opteron has less than 1 percent market share, according to Mercury Research's Dean McCarron. AMD wandered in the wilderness for a long time with sub-par processors, but a new core design called Zen has reawakened interest in the company. On the desktop, Zen-based CPUs are equal to or out performing top of the line Intel chips that cost three times as much. For the server, AMD has a new platform called Epyc that it hopes will revive interest in its server products. 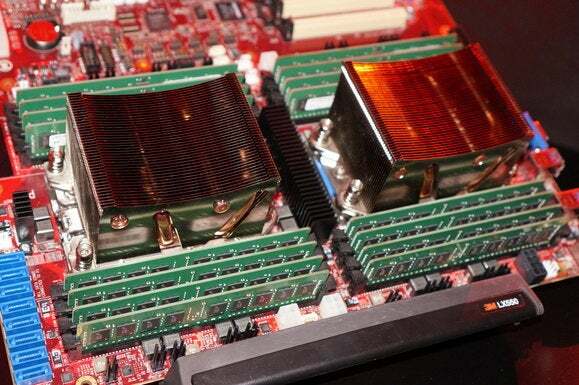 Naples is a beast of a platform aimed squarely at Intel's Broadwell-EP generation of Xeon E5 V4 processors. The Epyc CPUs have 32 cores, capable of 64 simultaneous threads, with eight memory channels supporting up to 2TB of 2400MHz RAM and 128 PCIe 3.0 lanes per CPU. By comparison, the Xeon E5 has 22 cores and 44 threads, four memory channels, and a maximum of 1.5TB of 1866Mhz RAM. But figure on that being bumped up in the next generation of Xeons, because Intel does not sit still. Forrest Norrod, senior vice president and general manager of the enterprise, embedded and semi-custom business unit at AMD, said he is not expecting 30 percent market share overnight but they are looking to re-enter the server market with a "highly differentiated product." "Opteron is gone. But I think we got the cred, we've been there before, we understand what it takes to build high performance processors, we understand cloud customers. And I think there is an enormous demand for a competitive alternative to Intel. A lot of the interest in ARM and [IBM] Power has been fueled by AMD's failure to deliver a high performance alternative and not have a competitive alternative," he says. Matt Eastwood, research vice president with IDC, said there is indeed interest in a viable alternative to Intel. "Intel is controlling an ever increasing portion of the server bill of material as they work their way higher up the system stack. Server OEMs are all very interested in alternatives that allow them to change the conversation with customers and focus on price-performance at the workload level. A strong platform from AMD helps them do this while also offering x86 compatibility," he says. "AMD has a chance but there will be some skepticism as they set out to prove that they can execute," Eastwood adds. "Many of the leading server OEMs, both here in the USA, and in China are very interested in bringing the technology to market. In my mind that was a much bigger hurdle than the end-users themselves." At a demo to launch Epyc (then Naples), AMD showed off a benchmark of a dual-socket Epyc system against a dual Xeon E5-2699A V4 system performing a seismic analysis. First the company hamstrung the Epyc machine by limiting it to 44 cores and 1866MHz memory, the same specs as the Xeon. It completed the workload in 18 seconds, compared to Intel's 35 seconds. When the Epyc machine was unleashed using all 64 cores and memory at its maximum speed, Epyc finished the workload in 14 seconds. The memory bandwidth of the Epyc platform is as much of a selling point as the CPU speeds, says Norrod. And with Epyc, AMD plans to target workloads that are memory bandwidth limited. "Memory bandwidth is as important as the CPU for a large set of workloads. The core is not twice as fast as the current core; it's just by marrying it with enough bandwidth we could keep the cores busy, whereas Broadwell choked," he says. Eastwood says the targeted strategy is an ideal one for AMD. "AMD is focusing on next generation analytic workloads, which are expected to grow nicely as digitally transformed enterprises adopt comprehensive application and data strategies which extend from edge to core to cloud. Others such as IBM OpenPower are targeting some of the same workloads, but AMD is doing this with x86 resource that is compatible with Intel. This gives customers the freedom to move back to Intel-based platforms at a future date," he says. AMD thinks Epyc will be great at software defined storage because it will have the capability to unblocked channels to be peers and go all the way into caches and DRAM, and well-suited for software defined networks where input/output (I/O) is at a premium. He also sees it used in other areas with large memory sets, like scientific and technical applications, big data analytics and anything else that involves plowing through enormous pools of memory. "We're not just interested in competing on general purpose server with price performance. We really tried to take that core and implement it in a SoC [system on chip] infrastructure that is distinctly different from what we think Intel is bringing to market. We're not trying for one-upmanship. We did what we did on memory and I/O because those were the right things to do to scale and unlock the full power of the machine," Norrod says. And while Intel could play a game of catch-up, Norrod believes it won't because it does not want to bring expanded memory bandwidth in the two-socket market because that would cannibalize Intel's four-socket business, where there is greater memory bandwidth. AMD is, for now, eschewing four-socket servers because it doesn’t see that as a growing market. "The trends of history ride strongly against it. On a unit volume basis, two-socket continues to be the overwhelming segment of the market. Four-socket and above is a gradually declining market," said Norrod.